The dancing Pin Heads: Just one of the treats at Lebowski Fest NYC. COEN TWICE:…while uptown, what may be their most cultishly-devoured work, “The Big Lebowski,” is fêted as the three-day NYC Lebowski Fest kicks off with a screening party at Terminal 5. 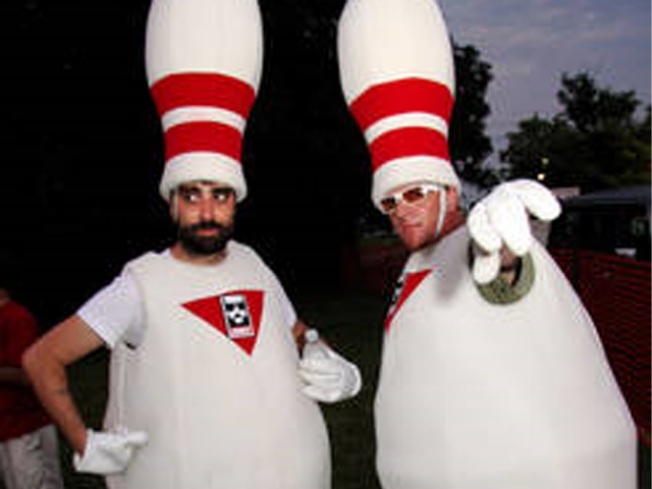 The Pin Heads – dudes who dress up as bowling pins and express their Lebowski love in interpretive dance – will be on hand, abiding. 7:30PM. STUNNINGLY FRANK: For most restaurant critics, the most important thing to conceal is their identity – without anonymity, they’re nothing. But ex-Times pro eater Frank Bruni had a much bigger secret: a sordid past as a bingeing, purging, diet pill-popping bulimic. He chronicles the experience in "Born Round: The Secret History of a Full-Time Eater" (Penguin Press, $25.95), which he’ll read from and sign copies of at the Lincoln Triangle Barnes & Noble tonight at 7:30PM.